2 8 P R I N T W E A R J A N U A R Y 2 0 1 9 EMBROIDERY Erich's Embellishments Salespeople are often natural recorders of information, and though their orders should already be in a system that gives you a historical overview, they should be encouraged to take complete notes beyond those found in orders so that they can es- tablish trends and use information on their customers and sales cycles to their advan- tage. Marketers and the wizards who run your websites and stores should be aware of traffic and results from promotions and published content. 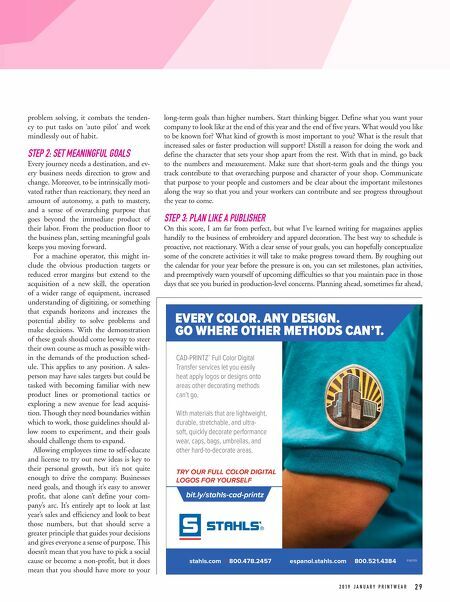 Owners and managers should check the pulse of each depart- ment, be aware of the overall trends, and know who to trust to produce detailed information when it's time to evaluate spe- cific segments of the business. Though a system of storage for each department's records is recommended, even starting with paper sheets and in- formal reporting will make a difference in your decision making. When everyone cultivates curious watchfulness, it not only provides a wealth of information for Project management tools can be useful for keeping tasks in order. This cloud-based Kanban style manager uses a simple but extensible card-stack metaphor to help you shuffle through planning. Cre- ating your stack of to-do items with attached checklists and due dates for months in advance can help you manage your potential work, and the team-based nature of apps like this can make it easy to col- laborate with everyone in your shop who needs to be in on a project. Allowing and even providing for self-study for yourself and employ- ees can enhance a sense of purpose along with expanding your skill- set. It doesn't need to be expensive either. 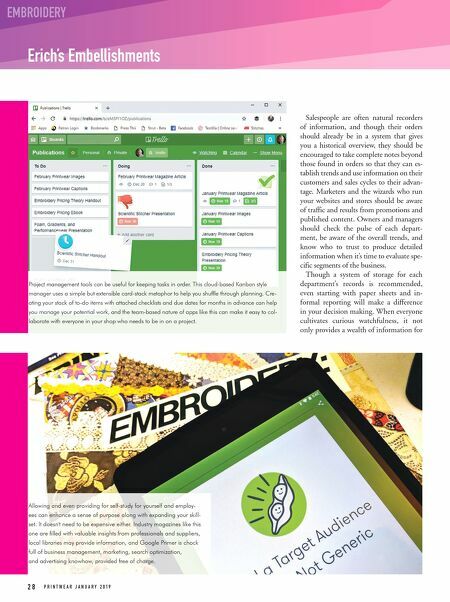 Industry magazines like this one are filled with valuable insights from professionals and suppliers, local libraries may provide information, and Google Primer is chock full of business management, marketing, search optimization, and advertising knowhow, provided free of charge.